Farm women lead busy lives: raising kids, supporting their husband’s endeavors, cooking, gardening vegetables and flowers…But for some, life would not be as rich as it can be if they didn’t “give back” to the community they are happy and proud to belong to. This was exactly the lifestyle espoused by Frances Sych of the Calmar area. She raised three kids and now enjoys the close relationship she has with her two daughters and several grand-children, while keeping a busy lifestyle, never forgetting her Ukrainian roots. In 1998, the Ukrainian Canadian Congress-Alberta Provincial Council (UCCAPC) initiated an Annual Hetman Award to acknowledge significant volunteer achievements of outstanding Ukrainian Albertans. The Annual Hetman Awards are dedicated to the celebration of all volunteers who have chosen to give their time, effort and expertise in order to keep our Ukrainian Canadian community in Alberta strong, vibrant and active. On Saturday, October 18 at the St John’s Cultural Centre in Edmonton, during its Annual Hetman Awards and 40th Anniversary Gala, the Ukrainian Community celebrated its hard-working champions, and Frances Sych, now a Leduc resident, was among them. Frances has a passion for helping her community. 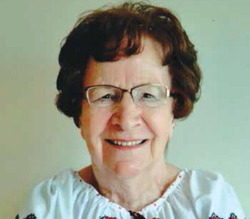 Since her marriage in 1952, she has been a member of the Holy Trinity Orthodox Church near Calmar where she has been a key supporter in many milestones celebrations as well as singing in the choir and teaching Sunday school for many years. With baking, catering and sewing she contributed to the construction of the current church and renovations to the Parish Hall. Baking for local fundraisers, being an active and generous member of the Holy Trinity Orthodox Church, being a keen supporter of the Zirka Ukrainian Dancers, the list is long about her lifetime of selfless contributions. She is one of ten people who formed the Calmar & District Historical Society and greatly contributed to the writing and publication of “Pioneers and Progress”, a history book on Wilton Park’s pioneer farm families. Frances was also a longtime member of the Calmar & District Senior Citizens Club, the Leduc West Antique Society and more recently, a loyal supporter of the Leduc Seniors Society. Without having to ask her, it is obvious that this charming, devoted and energetic lady’s secret to health and longevity is to keep busy and to devote time and heart to what matters the most: her family, her culture and the well-being of the community where she spent a lifetime. Congratulations to Mrs. Frances Sych on being the worthy recipient of a 2014 Hetman Award. In 2013, Larry and Donna Sendziak of Calmar were the first from our area to win this prestigious award. For information and details on other 2014 recipients, visit the www.uccab.ca website.